The Tascam DR-40 is a four-track digital recorder that I'm using for podcasting and game session recording. It's a way in which the existence of YouTube has made my life better. People think they're going to make their fortunes making videos, but the audio recording quality on most video cameras isn't all that great, so they want a dedicated audio recorder as well. This is that recorder. It's one of three models with similar capabilities. The cheaper DR-05 is a two-track recorder with built-in microphones, but no external inputs; the DR-40 has two built-in microphones and two hybrid (¼" TRS or XLR) sockets; the DR-60, about the same price as this, has no built-in microphones, two hybrid sockets, and a single ⅛" stereo input (and some functions to make it work better with a video camera). Tascam makes the manuals for all its kit freely available, so it's easy to work out which one might suit you. The DR-40 seems to offer the most flexibility, so that's what I bought. It can even provide phantom power on XLR, though this will be hard on the batteries. What it won't do is power a standard cheap "computer microphone", such as the boundary mics I've been using before; I'm still looking for a solution to this, but may well end up buying XLR mics. 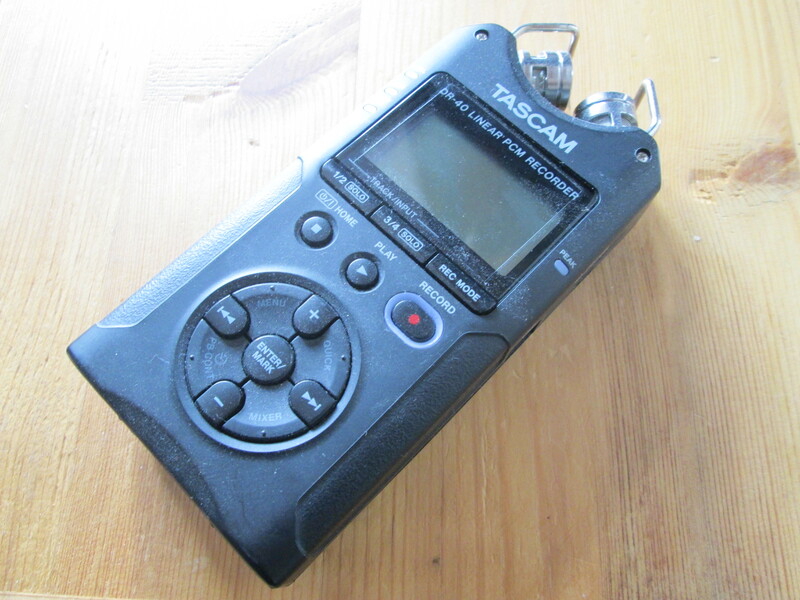 In pure stereo mode, I use it for recording the main body of the podcast, as well as for interviews away from home. I mount it on a small tripod for convenience (it has a standard ¼" threaded socket); it can be used hand-held, and has fairly good isolation, but noise from contact is always a concern. 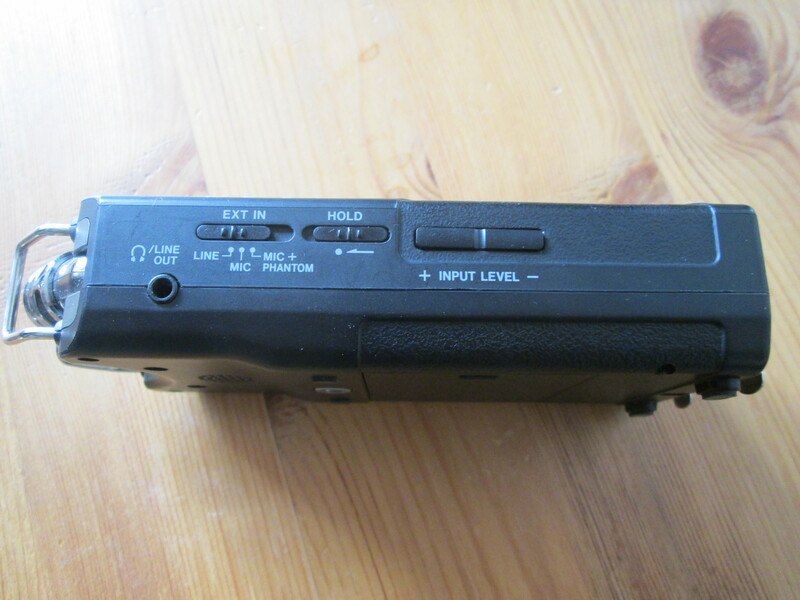 There's a small prop hidden inside the battery compartment, but even then the unit doesn't sit flat on a table. 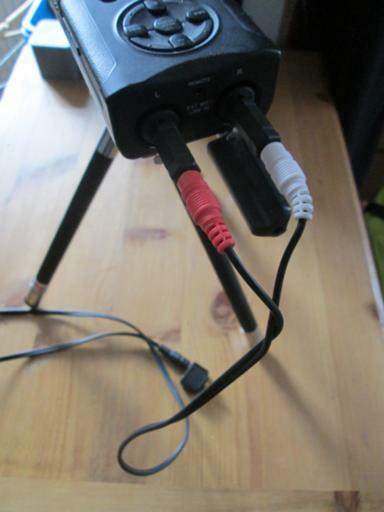 I record videoconferences on appear.in or Google Talk, such as my role-playing sessions with Whartson Hall, by pointing the built-in microphones towards me for tracks 1 and 2, then splitting the sound output from everyone else into both a pair of headphones for me and the line inputs for tracks 3 and 4. If they think you're crude, go technical; if they think you're technical, go crude. I'm a very technical boy. […] These days, though, you have to be pretty technical before you can even aspire to crudeness. It's all distressingly analogue, and the recording of me isn't off the same mic as the one that's getting sent to the other participants, but it gets the job done in a way that my software-fiddling with jack has so far failed to accomplish. Afterwards it's trivial to mix the tracks together. For people who Really Care about this stuff, you can move the internal microphones from their standard crossover (XY) pattern to an outward-pointing (AB) pattern. Input levels can be set manually, or you can let the machine do it on its own, or just tell it to compress loud sounds to prevent clipping. Recording can be from the built-in microphones, the jacks, or both; if you're only recording two tracks, you can automatically drop a backup recording at a lower level onto the other pair of tracks in case of excessive volume. There are also built-in overdub modes (to add new content to a recorded file, or to record the new content separately), a mixer, some reverb effects… for me this is mostly stuff to be done later in the editing software, but if I didn't have that I suppose this might be useful. (For example, if I ever want to multi-track my own voice against itself, I may well use the "overdub separate" mode to get my timing right against a guide track, if only because then I don't have to have a computer in the recording room as well as everything else. But then I'll combine all the tracks in audacity.) Playback, not what this thing is really designed for, is through a single rear speaker or a ⅛" headphone socket. There's even a guitar tuner built in. Alas, that's the only mode where you can invert the screen, so that you can read it when the microphones are pointing towards you. I could have done with this in other modes too; it seems that the target user of this kit is expected to be recording other people, rather than himself. Getting files off the recorder can be done via USB2, or simply by turning the thing off and transferring the SD card. Power comes from three AA batteries, or USB; I use NiMH rechargeables and get about 10-15 hours out of a set in two-channel mode, though I usually change and charge them after a single session just to be on the safe side. The case is mostly plastic, but it feels solid. This is strictly a recording device, please note: it won't act as a USB-based audio interface to a computer, or stream anything anywhere. There is a DR-44WL model which streams over 802.11 to smartphone or computer; I'm not interested in live audio, and I feel no urge to try it, especially as giving it IP connectivity opens it to whole new classes of attack which needn't be considered for a mere unconnected device like the DR-40. Tascam is not a computer security company. I haven't talked about sound quality. Well, it's hard to screw that up these days, and Tascam hasn't. Noise floors are beautifully low on internal or external feeds, but if you don't have a proper studio available you'll probably still want to record the traditional ten-second silence and do noise reduction on what you get out of the machine. How many podcasts have you done with this? Last time I knew you were on the computer mics, and looking at that FireWire device I tried for you. I have noticed a bit more variability of sound quality in the last few podcasts. I suspect this is a lot more convenient than using a laptop to record. 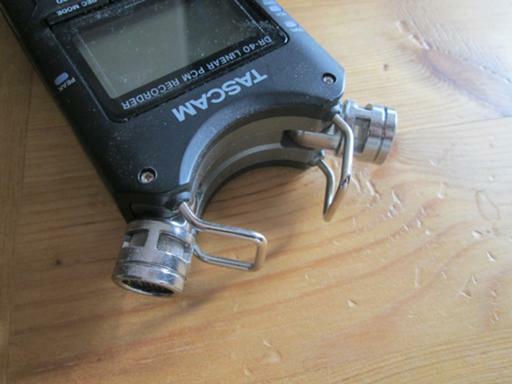 This is one of the devices recommended for recording bootlegs of rock concerts, I know this from my marginal (I've dropped out a bit) involvement in a Queen fan web site. The big difference is that the enormous sound level and dynamic range of rock concerts (I wear musicians earplugs for live concerts these days) overwhelms most microphones and they distort. There are ranges of mics made specifically to cope, and they need an external battery box as well to provide enough DC bias. Plus you need to hide from the security guys with some bands, so mics on the arms of your glasses or stuck under the brim of a hat are popular. First one with this kit was #37, with the Phil Masters interview we recorded at Dragonmeet. 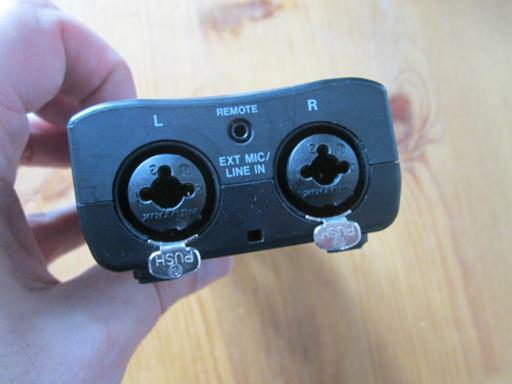 I do prefer the boundary mics to the built-in ones, but nobody seems to sell an adaptor because they assume all computer mics are rubbish. This is a fairly slim device (well, not by current mobile phone standards, but by portable-recorder standards) but I think it would still make a fairly obvious bulge under a jacket unless you were careful.